If you’ve ever walked in the Roberts bird sanctuary across the street from the Lake Harriet band pavilion, you know how peaceful and quiet it can be in there, and the wealth of birds to be seen. The sanctuary is threatened at the moment. The Minneapolis Park Board is considering two nearby sites for a dog park, a fenced area where dogs can run free. A dog park is a good idea. Dogs and their owners would make very good use of it. I don’t think anyone disagrees with that. Many people, however, believe that placing a dog park adjacent to a natural area that requires an undisturbed atmosphere to be successfully used is emphatically not a good idea. One site under consideration indeed adjoins the bird sanctuary. The other, in the Peace Garden nearby, is close enough to cause birds in the refuge to flee in alarm when dogs are seen or heard. There is a third site available that meets the needs of dog owners and their pets while avoiding the negative impact on the sanctuary that the first two sites mentioned would have. It is located at a nearby park board facility. The Roberts sanctuary is a gem. I’ve been there many times. It’s an urban oasis for birds and birdwatchers. It does not exist in kind anywhere else. Given land use and availability, the park board could not duplicate it. It needs to be protected, not degraded. Birders who use the sanctuary already put up with people who ignore the “no dogs” signs and walk their dogs there anyway. Dogs and birds are not compatible. You cannot eliminate a bird’s instinctive reaction when it sees or hears an animal regarded as a predator. The Eloise Butler Wild Flower Garden at Theodore Wirth Park is another wonderful place for bird watching. Dogs are not allowed. The garden is fenced to keep dogs (and deer and other animals not compatible with the garden’s intended use) out. I can’t imagine the park board considering a dog run at this location. And it’s easy to imagine the uproar from flower and bird enthusiasts and people who simply enjoy quiet natural places if such a proposal were to be advanced. If you wish to participate in a public discussion of this issue, a meeting will be held March 21, this coming Monday. It will begin at 6:30 p.m. at Lyndale Farmstead Park, 3900 Bryant Ave. S., Minneapolis. 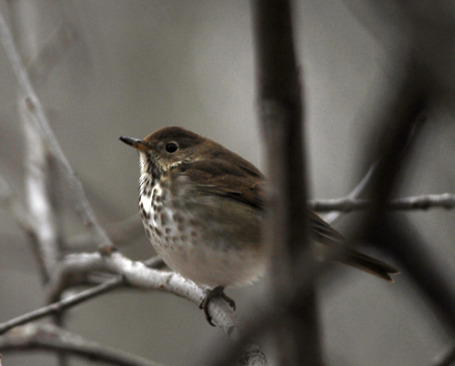 This thrush was photographed in the Roberts sanctuary.